After more than 6 months of broken login, I tried to test #73 today but due to a combination of old, stale out of date OS and packages, the whole system broke down and now I can't even get the game running. Maintaining the Trigger Rally server and database has been difficult, and although I could try to rebuild the server with fresh versions of everything, I would prefer to try a new approach: host everything on github pages. This would have the benefit of making it super easy for people to fork and modify the game, but I don't know how to support the track editor in that environment. Suggestions welcome! I will try to work on this new approach but can't make any promises about timeline. Next I need to fix the base path for client-side routing, and then start replacing the server API calls with local data. Mais c'est la meilleur nouvelle que je puisse entendre !! ce serait un réel plaisir si je pouvais aider au développement, c'est dommage que depuis quelques temps le jeux sois cassé. ce serait bien aussi d'avoir un contrôle de modérateur éventuellement pour les chronos à cause des cheaters :) je suis impatient de refaire un challenge à la sauce triggerrally ;) ce serait bien aussi pour la prochaine release que les trois type de véhicules deviennent accessibles genre étapes après étapes en réussissant des challenges? Garder le système de donation c'est évident mais aussi pourquoi ne pas ouvrir une boutique de contenu additionnel (skin, effect, decor object)? j'ai encore plein d'idées si besoin et je me défends sur blender :) ... toujours un plaisir de te lire , salutations et bon courage J. But it's the best news I could hear !! it would be a pleasure if I could help in development, it's a shame that for some time the games be broken. it would be nice also to have a moderator to control the times possibly because of cheaters :) I can not wait to make another challenge to triggerrally sauce ) it would be good also for the next release that the three types of vehicles become available such steps after steps by completing challenges? Keep the donation system that is obvious but why not open a store additional content (skin , effect , decor object) ? I still have lots of ideas and if necessary I defend myself on blender :) ... always a pleasure to read you , greetings and good luck J.
I'm very sorry, but it's heartening that someone did notice that it's down! I just watched your talk and was excited to try it out again after having played it before quite some time ago. I wish I could be of help, but unfortunately I just started out with Three.js. Is it possible for you to add a mode into the game where there isnt a time limit in the new version u made? My friends and I used to play this all of the time at school. Loads of fun. When you get it up and running again, can you get the logins for gmail working again? Can't wait to play it again. 3d rendering is incredible. Oh man its been 4 months! 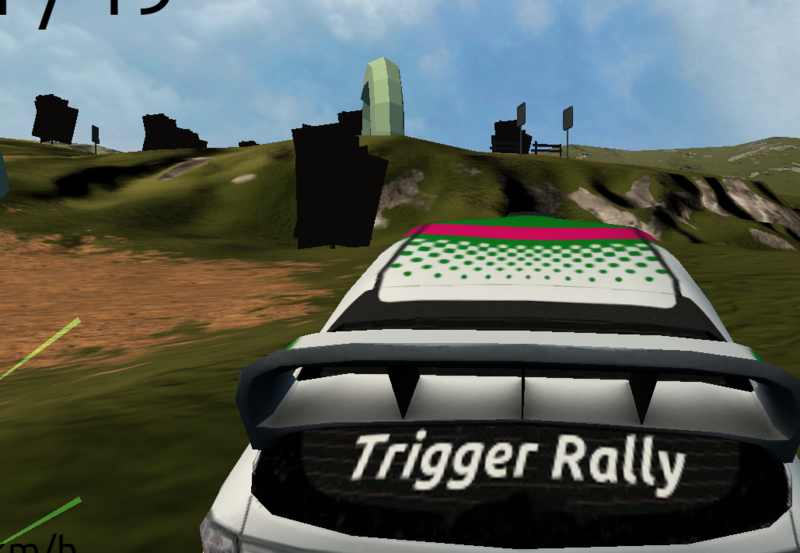 I miss trigger rally! I laugh so hard at that game because of the funny glitches! Hows it been going? can we see the update? If anyone is able to take a look I'd really appreciate it. Otherwise, still no ETA for this, sorry. Reply to this email directly, view it on GitHubhttps://github.com//issues/76#issuecomment-223719571, or mute the threadhttps://github.com/notifications/unsubscribe/AFXDiXHOBOeKYFuvAtaJi07bZ2NkWlQEks5qILu6gaJpZM4HGjD7. 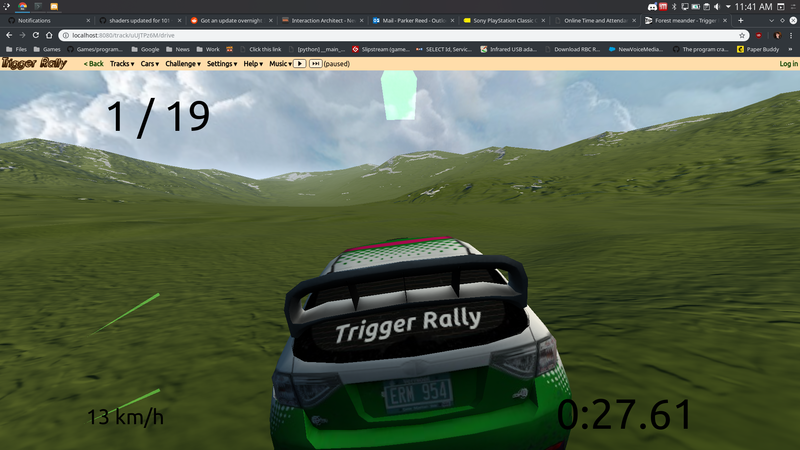 What I wanted was just to reverse engineer part of the terrain editor for my own game and engine https://bad.city but ended up resurrecting TriggerRally because it's one of the best Three.js and WebGL examples available. Not just an experiment but a real product. I never used coffee script before and just spent all night and day to get this to work but slowly managed to breakpoint and console.log my way through. 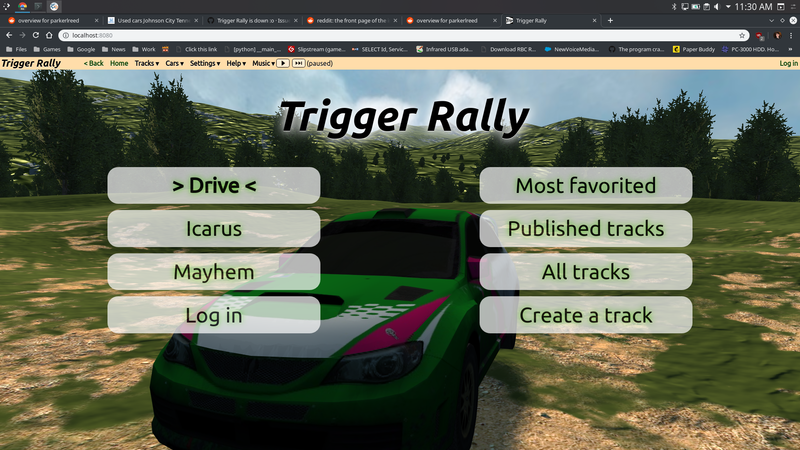 Found missing assets online(car JSON model, demo track from some old website dump https://github.com/sqliu/TriggerRally/tree/master/ ), found compatible packages version, I updated some and updated the code. It appears to work again! Wow, fantastic! Thank you @DVLP! @parkerlreed: did you get it to work? I don't have time to test it myself right now. I think it would be amazing if this could run off GitHub Pages, but I'm not sure how to handle the need for a backend database. Naah, I got some errors spat back. npm ERR! Failed at the trigger-server@0.0.1 start script. Ok that bson not found wasn't the bailing error. The error was it was trying to start on port 80 as normal user... I changed it to 8080 but now it bails at not finding the mongodb server running. @DVLP Do I need to start the database separately? Yayyy! Okay I'm going to merge this from sheer enthusiasm. @jareiko Do you still have all the old user created levels? Would be kinda cool to get those going. @jareiko I'm glad you're happy and don't mind merging these assets in. I guess in the past it was important to keep them separately because that was part of the potential business. If you still want to keep them separately in the future I have some other terrain map which I can add under MIT license, and the car shouldn't be difficult to make because it's just one solid mesh without moving parts(except of the wheel). Yes, that was the idea. But I don't intend to pursue the game as a business anymore, and am happy if it can be a useful learning resource for others. I don't remember what the licensing situation is for the assets. I guess the cars and terrain might be proprietary, so it would be good to switch them out for truly free ones at some point. Thank you for doing this - it makes me very happy to see it running again! It is fun to restore a project which is using now-outdated versions of packages and coffee script. 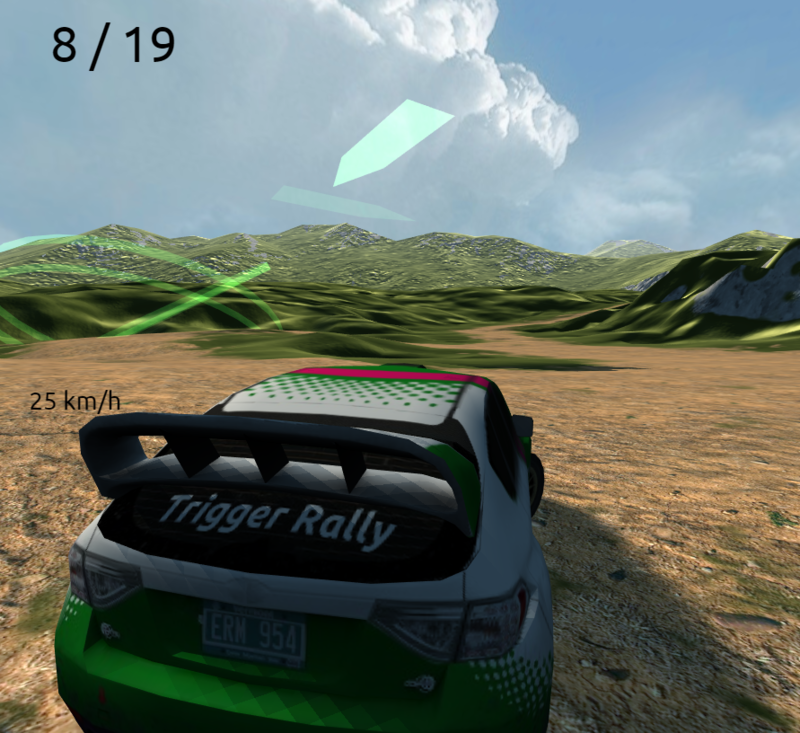 It feels like archeology work but at the same time it's a nicely written and polished code with many interesting and relevant elements so with some work can be updated to the latest features of desktop Trigger Rally and beyond. No miracles yet but this is THREE 101 version! Shaders(terrain with shadows, dust, skybox) updated for THREE 101. Dust points geometry updated to BufferGeometry with flat array attributes. 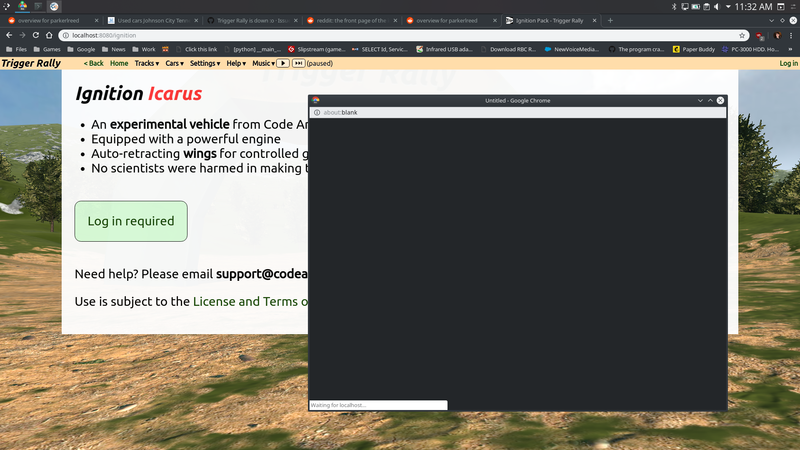 Also FWIW it doesn't render those objects in Firefox either. Is it rendering them anywhere? @jareiko If you want I can make a PR for this now. Now only the dust effect is missing. Dust particles are visible only during reversing so this must be a one liner fix which may take a few hours to debug. This shows the power of https://github.com/decaffeinate/decaffeinate project. With just a few hours of additional manual work it's all converted and working.